I will never forget the day I met my first guide dog, a beautiful black Labrador retriever named Fiona. It was around 1:00 in the afternoon, and I was patiently waiting in my room at Guide Dogs for the Blind (GDB) in San Raphael, California. I could hear the sounds of my classmates meeting their guides for the first time in the rooms adjacent to mine. I was nervous, excited and unaware of the many ways my life was about to change. Then came the knock at the door by my instructor, Stephanie. I opened the door to my new best friend. Right away I could sense she was spunky and confident. She and I were probably equally nervous, and Stephanie left us alone to have some bonding time. The two weeks that ensued were exciting and simultaneously tiring – both mentally and physically. This was all new to both Fiona and me, and I was working hard to be a confident leader of our new team. In the beginning we worked on the fundamentals — perfecting my hand gestures, foot positioning and simultaneous verbal commands. We practiced collar gestures and corrections and learned about how to take care of our new canine friends once we headed home. During the second week, Fiona and I had the opportunity to work in the Financial District of San Francisco. We practiced getting on and off buses and trains and getting exposure to working in crowds. We were getting ready for life in Chicago the best we could from across the country. After graduating, we came home and were welcomed by the support of friends and family. We immediately went to work on the sidewalks of a beautiful Chicago summer. One of the expectations GDB is clear about in training is that the first six months of life with your new guide dog will require dedication and hard work. As a new team you will continue to develop a bond, learn new routes in your home city and continue to meld into a cohesive team, growing your understanding of one another’s body language and needs. So I took this to heart; this is supposed to be work. And I gave it my all. From the beginning, Fiona’s guide work was beautiful. I mean, pretty much textbook perfect. She learned our routes quickly, positioned us perfectly at up and down curbs and could work through a crowd without a moment’s hesitation. She constantly amazed me when she would wind us through a bustling O’Hare airport or the congested Clark and Lake Train Station with total ease and grace, a feeling of the seas parting as we moved effortlessly through the hustle of other travelers. Is This The Way It’s Supposed to Feel? From the beginning, Fiona and I had difficulty with dog distractions. This isn’t all that uncommon from what I gather when talking with friends who also have guide dogs. Sometimes we could work past an approaching dog with little more than a verbal reminder to Fiona to stay the course and ignore the dog. However, other times it was more difficult, with Fiona’s mind made up that we were going to say hello to an approaching dog regardless of my expectations. At that point I was left planting my feet and standing my ground firmly, or else risking the chance of being pulled down by her enthusiasm. Plus, living in the neighborhoods of Chicago, particularly in the summer, dogs are everywhere! This isn’t something I noticed prior to my new guide dog lifestyle when I traveled with my white cane. For the most part, dogs move silently past you when you’re traveling with a cane, but once you’ve got a dog of your own, it quickly becomes obvious that dogs are abundant! In fact, we kept trying for months — five months to be exact. During those five months it felt as if we had tried every strategy in the book. And as winter approached, I felt more and more conflicted about how things were going. 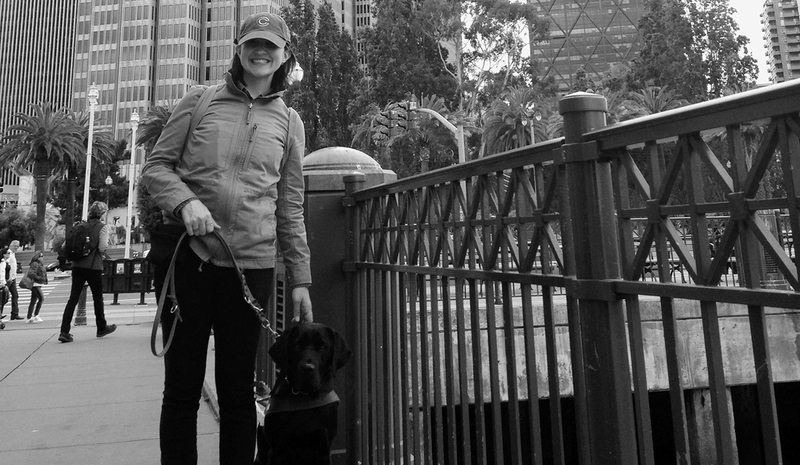 Most importantly, the trust that is critical for a successful guide dog team was eroding. My husband and I learned in early November 2018 that we were expecting a baby. This was thrilling news and something we’d been dreaming of for years. As the weeks crept by, I was feeling more and more tired from the difficulty of the first trimester of pregnancy — exhausted and nauseated every minute of the day. There was one particular day in early December when Fiona and I were on a route to an appointment in a nearby neighborhood. I was feeling sick to my stomach (like usual) and the simple act of walking required the effort of moving through quicksand. Along the route — it happened twice- we encountered dogs, and Fiona’s will was stronger than mine. She almost knocked me off my feet both times and it was more than I could bear. I arrived at my appointment disheartened and exhausted; I burst into tears the moment I was in the presence of my health care provider, and she offered a warm hug and cup of tea. It was in that experience that I knew …this was more than I could handle. I made the decision to ask for a training evaluation from my guide dog school. This basically means that I was asking the school to evaluate her to see if additional training from them could be helpful. It is also possible that the instructors will decide that a guide should be retired for safety reasons. It was a scary and unpredictable next step, but I knew that we couldn’t continue as we were. I had done all I could, and I had to trust myself that I had tried my hardest and exhausted all other possibilities. However, the idea of losing Fiona was heartbreaking. Once Fiona was back at guide dog school where she was being evaluated, I was again navigating the world on my own. It felt lonely for sure but there was also a sense of calm in navigating with my white cane again without the constant anxiety of being alert for approaching dogs. I waited for five weeks before receiving the news that Fiona was going to be retired. The instructors at GDB took their time with the decision, and really got to know her. They saw the wonderful qualities in her spunky personality and great technical skills. But in the end, they also shared my concerns about safety. My story has a happy ending. I was given the opportunity to adopt Fiona and have her as a pet and companion. I feel so deeply bonded to her that I knew if I were given the opportunity, I would jump at the chance to bring her home. As either a guide dog or a pet. This is not the end of my guide dog story. I will absolutely try again, once it makes sense in my life. Living life with a guide dog can be liberating and fulfilling, but it can also have its challenges. It doesn’t always work out. That was hard to cope with for quite a while. However, since I’ve had the space to reflect on my time working as a team with Fiona, I realize it taught me so much. It taught me about my own resilience and the trust acquired as a guide dog team. Above all else, it taught me to trust myself to know when something is working in my life and to acknowledge when it isn’t. Living as a woman with a disability, life can have many unique challenges. Having and then losing my guide wasn’t one I would have predicted. But here I am, on the other side, feeling gratitude for what it gave me and a deeper understanding of my capabilities. Andrea is a client and volunteer at Second Sense. Hi, I love your story, especially because I can relate with everything you went through, aside from the pregnancy, lol. I too had to return my beautiful Kiley to GEB. She was also retired. I have remained without a guide dog for many years now. I hope you give it another try. Thank you for sharing! And it is so helpful to know I am not the only one with this experience. I do plan to try again when the time is right. It was difficult and rewarding. It sounds like you felt the same way!